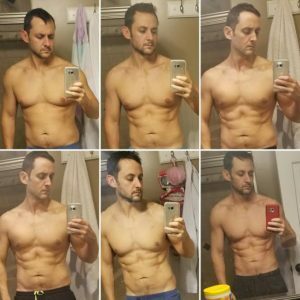 Chris Crater is a father of two who lost 20lbs in 12 weeks, and is now certifiably shredded! Check out the advice he has for making nutrition changes work for you! My initial goal wasn’t so much weight loss, it became that. You can see in my “before” photos that I needed it but I wanted body composition change. I tried the macros thing before by myself and was trying to stick to paleo principles, but it was hard. I wasn’t confident how to do it and what ratios to shoot for, so I needed guidance in those areas. I went to a nutritionist before and she helped me a lot, but this was a different purpose, changing my body composition and taking performance to the next level. Initially just from talking to Coach Raye, I could tell she was knowledgeable, I laid out what I’d normally eat throughout the day. It wasn’t horrible, following paleo I sort of knew I was eating too much fat, I didn’t think I was getting enough protein in my body, and I also wasn’t sure what to do about carbs because I was always told you shouldn’t be eating that many carbs. After going over a normal day of eating, Coach Raye reprogrammed me from the start and gave me very sensible feedback. I think post-workout nutrition was one of the biggest things we altered. I wasn’t eating nearly enough carbohydrate after training. After making the changes I lost 20lbs, I didn’t lose strength, and gained endurance. I found Coach Raye to be both smart and responsive and it’s easy to log food when I know someone is checking in weekly. The accountability is huge for anybody. Coach Raye also taught me a little about nutrient timing, especially with carbohydrates, and it good to have somebody to bounce ideas off of. Plus, if I’m going to get nutrition advice from anyone, its from a woman who can squat more than me! The whole weighing of the food thing was something I didn’t think I would want to do. I just don’t think its a way to live your life, putting everything you eat on a scale. I was recently down in Georgia dropping in to a CrossFit gym and they were doing a macro challenge and asked me for advice. I told them the first week might sound daunting, I thought of my mom’s food scale back in the day but the digital scales are really easy to work with. As I told them, just the education of knowing how much food you’re putting into your body is a great lesson. Its an education in food. I was on that trip in Georgia for two weeks over Christmas break and didn’t bring a food scale, but I still knew what everything looked like by eyeing it out and I was pretty accurate in estimating what things weighred. Thats huge, I always thought a serving size of meat is like a pack of cards which makes no sense to me. You learn how to work it and now that I’m on my 4th month its become a lifestyle, I don’t really even have to think of it. By the second week it already started being easy! There’s a lot. Something that’ll stick with me for a lifetime really is that I never knew what a serving size was, which sounds crazy. I’m 38 and I never knew what anything was supposed to look like. In MyFitnessPal a medium sweet potato is 200g and I’d weigh what I thought was a medium sweet potato and it would end up being 400g. Learning what food is supposed to look like is something I wish I learned in elementary school! I think that the reintroduction of carbs was huge, and I welcomed it. Its nice to have a bagel once in while, and it helped my body run better. I have a lot more energy. I’ve hit a lot of CrossFit PR’s with the lighter workouts like Fran. Endurance has been really, really high. Last thing is if you were to tell me that I’d lose 20lbs eating rice daily, that’s what people tend to believe, it couldn’t happen, but you have to be smart about things. Now that I know it, I don’t even have to be smart about it, its just engrained into my thinking now. Tell them to buy in. Really buy in and do it for the first 2 weeks. After that it gets easy. I was telling a friend who started the Beyond Macros program to just buy in, put your head down, don’t talk about it, do what they say. The coaches clearly know what works for a body. If you get over the two week hump when everything feels daunting and overwhelming, you’re set up for life after that. You can eat anything you want, its not like I eat steamed veggies everyday, you just have to balance it out. If you’re going to have pizza tonight, eat more protein with your lunch. My fear if its someone’s first time working with a nutritionist, and they slip up once or twice that they’d get down on themselves and they don’t need to do that. There are coaches to keep you accountable and help when you need!